Hanmer Springs is a small town in the Canterbury region of the South Island of New Zealand. The town is named after Thomas Hanmer, an owner of Hawkeswood Station near the Conway River during the 1850s. The locality was discovered for its hot springs by William Jones in early 1859. Access to the general area was provided by a bridge over the Waiau River in 1864 constructed by a Mr Handisides of Nelson for NZ£2,000 to a design by John Blackett. The bridge lasted only ten years before it was blown over by a Nor'west wind. John Turnbull Thomson surveyed the land for the township in 1879, with the total area comprising 2,500 acres (1,000 ha), of which 300 acres (120 ha) were for the township itself. The hot springs were not included within that area. The springs themselves were still in their natural state at that time, with only steps and a changing shed provided. The member for Ashburton, Edward George Wright, brought up the question of developing the township in the New Zealand House of Representatives in June 1882. The Minister of Lands, William Rolleston, replied that it was important that the public should retain access to the springs. Surveyor Walter Kitson was instructed with laying out the site of the hot springs including an accommodation house. Construction of a bath house began in January 1884. The fifty year jubilee was held in 1933, stating that Hanmer had been a government resort since 1883, but the centenary book pointed out that the jubilee was held a year too early. The government investing significant funds into Hanmer Springs without a bridge crossing the Waiau River caused considerable controversy. Blackett designed a new bridge and John Anderson from Christchurch won the contract to erect it, and built a foundry at the site. This second bridge opened in 1887 and gives access to Hanmer to this day, with the structure registered as a Category I heritage item since 1983. The opening celebrations held by Anderson's sons at the site were rather liberal to the extent that the site is still known as Champagne Flat. In order to provide timber for the Christchurch market, reserve land was set aside between 1900-1901. The planting of exotic trees began in 1902, and in 1903 prison labour was used. The prisoners who took part in the planting resided at a nearby prison camp which operated until 1913. It is located 65 kilometres southwest of Kaikoura (135 km by car), in the Hurunui District and 130 kilometres northwest of Christchurch. The town lies on a minor road 9 kilometres north of State Highway 7, the northern route between Christchurch and the West Coast via Lewis Pass. The township lies at the base of Conical Hill. According to the 2013 census, the resident population is 840. The town is built around popular hot springs. The hot springs were produced by the fractured rock bed along the Hanmer fault. Hanmer Springs' Queen Mary Hospital, the South Island's leading rehabilitation centre for sufferers of drug addiction, was controversially closed in 2003. The premises were purchased by the Department of Conservation in 2008. In 2009, a 4600 square metre extension to the hot pools complex was proposed including "a second [16m high] water-slide, ice-skating rink and relocating and reconfiguring the freshwater pool." During the consent process oppositions were made to it by, among others, the Queen Mary Reserve Trust concerning the expansions effect on noise levels and visual impact. Concerns were also raised by former hospital superintendent, Dr Robert Crawford, about the change the development might have on the village’s brand of "slow tourism and relaxation, not wet’n’wild." After a hearing from independent Commissioner Robert Batty, on Monday, 18 January 2010 the proposal was approved. "The freshwater pool, new buildings, water slide/super bowl and the aqua play/ ice skating area are all to be on land from the subdivision of Queen Mary Hospital land." Hanmer Springs is a popular tourist destination, and the town's population swells during holidays. Bungy jumping, jet boating, mountain biking and bush walking are common tourist activities, and there is an airline service available for the viewing of the town's alpine surroundings. A Visitor Information Centre next to the hot springs provides information about the area and booking facilities for transport. Trampers can obtain weather information, maps and guidance from the Department of Conservation. Budget accommodation includes a new youth hostel. Two daily shuttle bus companies travel from Hanmer Springs to Christchurch and back. The town is the gateway to the Molesworth station, Lake Tennyson and Rainbow station. During summer months, gravel roads through the Rainbow Valley to St Arnaud and the Nelson Lakes National Park, and through the Molesworth Station to Blenheim, Picton, and the Marlborough region are frequented by travellers, four-wheel drivers, and guided tour groups. There are two skifields in the Hanmer Springs area: the Hanmer Springs Ski Area and Mount Lyford. ^ "Site Information for NZHR in Hanmer Springs Airport, CAN, New Zealand". 42.5508;172.826996: Server.gladstonefamily.net. Retrieved 16 May 2016. ^ Discover New Zealand:A Wises Guide (9th ed.). 1994. p. 371. ^ a b Ensor 1983, p. 4. ^ Ensor 1983, p. 12. ^ Ensor 1983, pp. 6f. ^ Ensor 1983, pp. 7–9. ^ Ensor 1983, p. 9. ^ Ensor 1983, p. 10. ^ Ensor 1983, pp. 13f. ^ "Waiau Ferry Bridge". Register of Historic Places. Heritage New Zealand. Retrieved 14 July 2016. ^ Ensor 1983, p. 14. ^ Christchurch City Libraries (2017). "The prison camp, Hanmer Springs: Picturing Canterbury". Christchurch City Libraries. Christchurch. Retrieved 8 December 2017. ^ "Example of Rare Architecture Worth Saving". New Zealand Historic Places Trust. Summer 2003. Archived from the original on 22 November 2008. Retrieved 22 November 2009. ^ Keey, Roger (5 December 2003). "What will be the future of Queen Mary Hospital and its grounds at Hanmer Springs?". nzine. Retrieved 22 November 2009. ^ New Zealand Alliance Party (22 October 2008). "Queen Mary Hospital has been saved by DOC - why?". Scoop. Retrieved 22 November 2009. Ensor, Rosemary (1983). Much Ado... Christchurch: Hanmer Springs Centennial Committee. ISBN 978-0-473-09696-0. 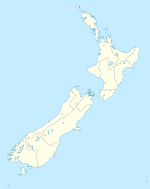 Wikimedia Commons has media related to Hanmer Springs.